Dyeing is fun because sometimes, things turn out exactly how you expected, and sometimes they don't at all. Both were the case for my most recent dyeing session. I dyed with a combination of Kool Aid and food colors. My main objective was to dye a length of angora/merino top, which I have been saving for this purpose for quite some time. 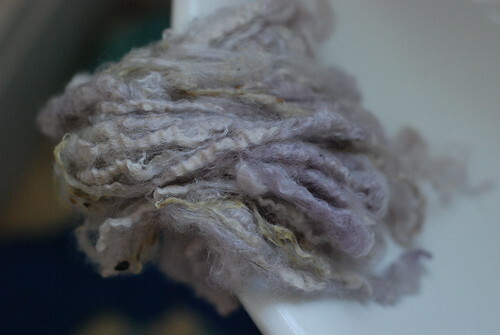 I love angora - the fuzziness, the softness, the delicate halo. I've tried spinning pure angora but have found it difficult - I'm hoping with the addition of merino, it won't be quite as much of a challenge. The top came out almost exactly how I wanted - A gradual orange-red-purple gradient. The other stuff I dyed turned out very different from how I expected -- but still interesting in its own way. 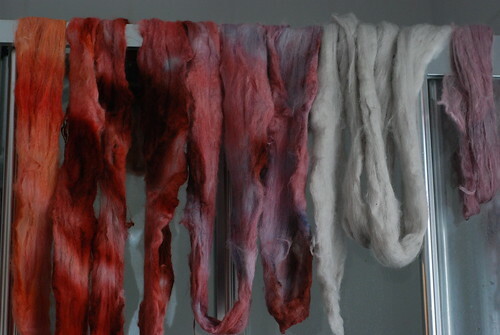 I had read on Ravelry about a method of dyeing raw fleece, without worrying about scouring beforehand. The idea intrigued me, so I gave it a try. I tossed some Romney locks and some Oxford Down into the dyepot - two very different wools. The former is long and lustrous; the latter short and crisp and springy. The fleece took a little bit of color, but nothing near as much as I was hoping. The Romney dyed better than the Oxford, but it's still a very pale purple. Actually, the color is beautifully subtle even if it wasn't what I intended - in some lights it's clearly lilac, while other times it's silvery grey. The shades also turned out differently because the Oxford wool is yellow-cream colored, while the Romney is whiter. Here's a comparison of the Oxford Down before and after dyeing - there's clearly a difference, but the color is subdued. The greasy fleece just wouldn't take color the same way that clean fiber does. 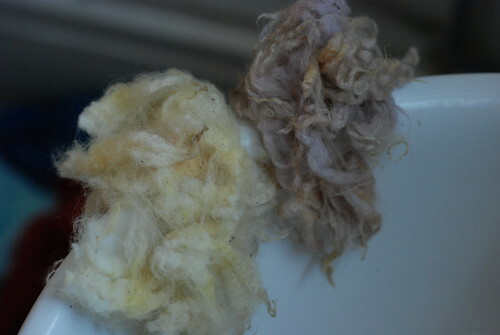 Next time I dye fleece, I will probably scour beforehand! I'm planning to use the fleece together in a pair of socks - I love the contrast in texture between the two fibers, and I think it will be really interesting to use them together in one project. Sometimes it's hard to believe that this range of fibers all come from sheep and not completely different animals.